A few months ago, I was able to pay off my house. It took us 71 months from the day we purchased this home to pay it off. We learned a lot along the way – some of it quite surprising to us. Hopefully, the lessons we were taught will help you in your quest to eliminate your home mortgage! It required laser-like focus. Paying off our home required immense diligence. We did not just stumble upon this. We put off fun purchases. We could have used the additional principal payment money to purchase a 4-wheeler (I really want one!) or upgrade our kitchen (my wife would love this!). We chose not to do this. Vision helped keep us on track. We used the “Early Pay-Off Calculator” to see how additional principal payment money would speed us toward elimination of the mortgage. This provided vision of what really could happen! A goal motivated us. Way back in December 2002, my bride and I set a goal to be mortgage debt free by January 2014. We did not know how that would happen or if it could even be possible. It was! Home repairs will compete with your focus on mortgage elimination. As we focused on killing the mortgage, things in our house wore out. The paint on the exterior wood siding faded while we focused on mortgage pay-off. The dishwasher bottom was torn off by our toddler, the stove started “dinging” at random times, and the hot water heater stopped heating. If we had not completely eliminated the mortgage, the extra principal money would have been forced to be used on necessary repairs. My bride and I had to be on the same page. I cannot imagine attempting to eliminate debt without my bride being 100-percent on board with it. There were times when I wanted to stop, and she was there to encourage me. At other times, she would want to slow down or quit. I would help remind her “why” we were doing this. I’m grateful for a bride who is an active participant in financial decisions – especially the major ones! It’s hard to stay focused when your house is going down in value. Like many people, our home experienced a decrease in value. It can be very frustrating and demoralizing. However, these emotions do nothing to eliminate the debt obligation. This is when “put your nose to the grindstone” took on an entirely new meaning for us. Making it “visual” helped make it more fun. We created a “Sangl Home Pay-Off Spectacular” (see one HERE). This allowed us to give a dollar value to each little square of our house. As we paid off a square, we were able to color in the square. It really helped us “see” the fact that we were making progress in eliminating this very large debt. Paying off your house will not eliminate all housing costs. You will still be responsible for taxes and insurance. Repairs will be needed as well. We’re preparing for this by saving for these expenses every single month. This process makes you a better money manager. This extended period of financial focus increased my financial prowess in ways I never expected. It extended my vision from “one month at a time” to “years into the future.” This has truly positioned us for an incredible financial future. BONUS: Anyone can do this! Having completed this process, I am more convinced than ever that ANYONE can do this. Yes, it will require encouragement and equipping, but it is indeed possible. 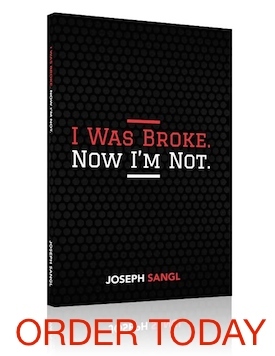 It makes me more fired up to pursue the vision of I Was Broke. Now I’m Not. which is to help people accomplish far more than they ever thought possible! Have you attempted to eliminate your mortgage? Maybe you already have? Share your lessons with us in the comment section!